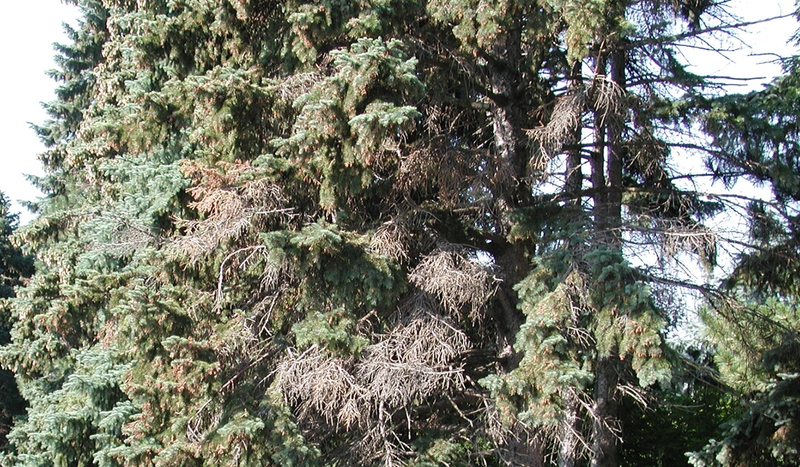 A disease causing branch dieback in many species of conifers, particularly in Colorado blue spruce. 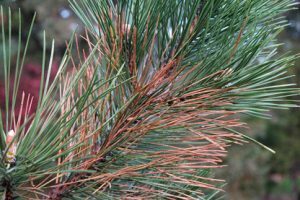 This disease also attacks other two and three needled pines such as mugo, Scots, and red pines. Cytospora attacks weakened trees that are growing under stressful conditions. Stress can be caused by many factors (root damage, poor soil conditions, heat, salt), but especially by drought. There is no direct cure for cytospora. 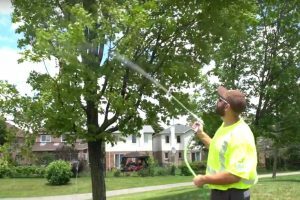 It is important to remember that cytospora attacks weakened trees, so methods of treatment should focus on improving the tree’s health. Making the tree healthier may enable it to prevent further advancement of the disease. Cultural practices such as pruning dead and dying branches, fertilizing, mulching and watering will help to improve the tree’s health. Note that a watering program should extend into the fall season because the roots of most conifers grow more at that time than at any other. I have two blue spruces. Almost all of the needles from the branches near the bottom of the trees fell off. At certain spots on the truck there are some white sap coming out. How to treat this problem and prevent it from getting worse? Would the dried branches coming back ?